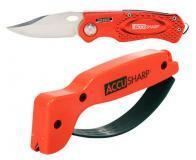 Accusharp presents the perfect combo pack joining the two-step knife sharpener with the Accusharp folding sport knife. The Accusharp SharpNEasy 2-Step Knife Sharpener provides exactly what someone needs to care for and maintain their blades, The two stages allow for the proper angle every time by havign two stationary rods molded into the base. The Accusharp Folding Sport Knife is constructed of anodized aluminum and stainless steel providing years of rust-free use. With the patent-pending wheel lock, you have the ability to open and close this knife with one hand. The belt clip ensures that this knife will always be by your side when you need it. It also has a glass breaker feature.